Hey everyone! I am SO SO SO SO SO excited to officially unveil the new M$M today! I've been wanting to have the site professionally designed for a few months now, but I was having a hard time deciding on who I wanted to go with for the design (lots of talented people out there) and also…custom work like this is not cheap. If you're a new reader, original reader or have just been around for a little while, I want to take you (and myself) on a little trip down memory lane. After I had finished paying off my $40,000 of student loans in 18 months, I felt like I almost had some kind of responsibility to share my thoughts about $$$ with other young people. I did some research on blogging, and decided like a lot of people that I wasn't quite ready to jump in and create my own website. I just wanted to dip my toes in the water with a page on Medium. 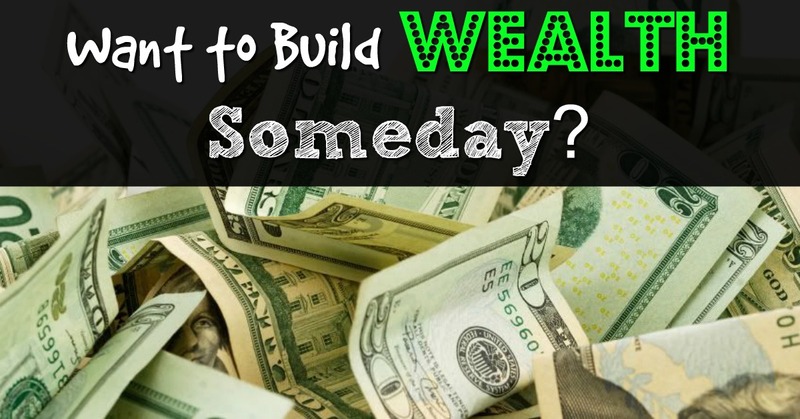 So, I wrote my first post about money, shared it on Facebook…and waited. It was actually pretty well received! Since then my writing style has changed drastically as I've learned how to get my point across more effectively and efficiently over the past two years. But, my first post was actually pretty decent if I say so myself. So, I decided that after a bunch of my friends had shared the post I would go ahead and start my own site! I was SUPER excited about it, and started looking for a domain name. I originally wanted to call the site “moneymillennials.com”. Fortunately for me at that time it was already taken (I just checked it out again and that site is still up, but doesn't really have any content on it). What if that name was available? Would I have been able to turn this into a career where I make $10,000-$15,000/month blogging? Maybe not, but who knows haha. 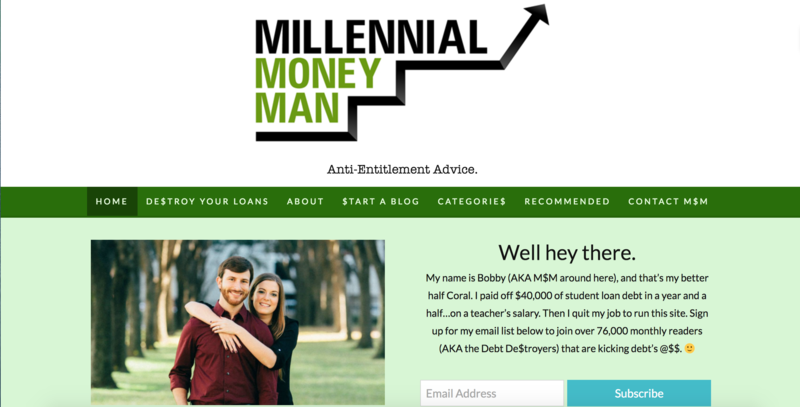 After what seemed like hours of searching, I stumbled onto MillennialMoneyMan.com. I actually thought it was kinda weird because it had a Superman/comic book character type feel to it in my mind, but it was the best I could do and I was tired of looking for new names. Thank goodness I got lazy. The next part is the reason why I created a free blogging course that you can find on the sidebar of the site now. I didn't exactly know what I was doing in the beginning of M$M, so I wanted to make a resource that would help to get people started in a great direction with their blogs after they took the course! No logo, just a couple of pieces of content, and really not much else going on. I really felt like a minimalist type design would work best since I didn't have much content to share yet. Actually on his advice, I purchased a Thesis theme that I had been running the site on for about the past year and a half (I'll talk about that in a second). One great investment I made pretty early was my logo. I allllllmost changed it on this current design, but I love the original one way too much to mess with it yet. I ran this theme for about the past year and a half, and am VERY proud of it. If you're wanting to get a nice theme that's better than a free one and doesn't cost several thousand dollars like my new design, you'll want to head over to Diythemes.com and pick up a Thesis theme and skin for your site. You don't really need to know how to code anything (it's essentially drag and drop), but if you do know some code you can use it as well to customize a little more. They have good support forums and always answered any questions I had along the way. If you've considered starting a blog…. For you future bloggers out there – design is less important than great content in my opinion. There were a lot of things that I was technically doing “wrong” with my previous website design, and I still managed to create a pretty awesome following and income. I didn't even have social media follow buttons on the website over the past year. Isn't that crazy? Live and learn. Well, obviously I'm going to keep pushing the same message of debt freedom and kicking @$$ with your money as a young person. I'm also going to start providing more resources for all of you out there that want to make more money online. I think I have a lot to offer in this area, and I'm basically the middle ground for info you can find between people that make zero dollars online and those who make $1,000,000 per year. So take a look around the site, check out the new freebies (courses, guides, etc.) and let me know what you think! And – I have to give a quick plug to my new friend Zach Swinehart who designed this site. I stayed up to all hours of the night for the past few weeks going through the design with him, and I'm SO stoked about how it came together. He's ultra talented (best in the business IMO) and made what could have been a stressful process a lot of fun. You can find a link to his site at the bottom of M$M. Just FYI, if you're a CFP or CPA, he puts out some killer websites in that genre. Also, if you're new here or have been around from the start – thank you so much for all of your support. I couldn't do this or reach/help the amount of people that I do without all of you. Like the new digs? Let me know what you think! Hi Bobby! Let me be the first to congratulate to the new design. It is awesome. Despite I liked the old one and the new is a little bit strange at first sight, but I think we will get used to it soon. I like the lot of green (reminding me to the calmness of nature AND money) and the other vivid colors, also well arranged and logically organized. Good job, keep it up. Congrats on your great new design. I love to see from where you come from your first design, it’s crazy. Haha isn’t that cool? It’s always fun to go back and look at those previous ones. Kinda keeps everything in perspective! Great design, I like that it feels familiar from V3 but all grown up. The menu bar is sleek and modern and the featured post is a nice addition. I’m sure you’re excited to be able to focus on content again now that you’ve got the framework on point. Looking forward to seeing more! Congrats on the new design, I really like it! I’m sure you guys put a lot of work and effort in it. Haha it’s a process for sure – glad you like the site! Site is looking good man! I liked the old lay out too, but it’s cool to see all the retooling that goes on behind the scenes. Really interesting to see where the site came from too over just two years. Thanks! Yeah I liked it too – but I knew if I wanted to grow the site more I had to make some changes and make everything easier to find. Your site is looking gorgeous!! I really like the modern touch and it feels so inspiring at the same time. Keep up the great work Bobby!! It looks great! Very professional looking, yet not so drastically different that I can’t find my way around, keep up the good work! Oh I’m so glad you said that – that was one of the big things that Zach kept pushing as we were talking through the design. Wanted to keep it similar enough to where people weren’t completely lost. Omg! I was JUST on your site yesterday and said to my husband “Look, Bobby changed his site! He didn’t send an email out about it! Ruudeee!” (in a sarcastic tone of course LOL) I absolutely love it…your Free Blogging Course link in the sidebar entranced me and caused me to sign up last night! Pretty excited about that! Hahaha sorry!!!!! I was trying to do a “soft-launch” yesterday so I could get some of the bugs worked out. Hope you like the course! It’s got a bunch of the content that I talk about in my blog coaching sessions (not everything but definitely enough to get started) so I think it will be pretty helpful. Looks good! I liked the previous version too but can see why you made the update. I think too many bloggers focus on the design first (rather than content, growing a following, etc. ), your approach is far better. It’s always smart to freshen things up (especially when you know what you want to highlight, like the income reports, looks good man. Love this new site Bobby. Looks a lot more sophisticated and easier to find things! Sure am glad you kept the picture of you and Coral! Good luck with the new design. Awesome. I love seeing the transformation from the beginning until now. New site looks great. One question. When you first had a logo designed, who did you use? I love the new design! It looks awesome and more modern than your original one. Love the income report in the top of the bar! That should really attract some more views! Its been awesome to see you grow as well! One word Bobby….fantastic! The site looks incredible, I especially love how interactive you and Zach have made it. You’ve built a great platform for future growth to be sure, it’s money well spent! Thank you! Yeah Zach knocked it out of the park, I was really just there to give my thoughts during the process and tell him what I liked. I can almost hear all the “ooohs” and “ahhhhs” over the air waves – I’m digging the re-design, Bobby. Congratulations! That was really the biggest complaint that I was getting from readers – too much of my older content was buried. Definitely worth it! This is so freaking cool. As a reader since the beginning it’s awesome to see how far the site has come! Keep It up Bobby! Thanks! Yeah it has definitely come a long way. Crazy to look back at the old designs. The site looks great man, good job! As a relative newcomer in the online personal finance space, I quite agree that content should come before design. I’m just viewing your new look on mobile right now, and it looks very good, job well done I say. I especially like the category icons, nice touch! Love the new site! I also love the brief history of your website and your story! It’s very inspiring to a new blogger such as myself! Keep kicking @$$, and I wish you the best of luck moving forward! Website design looks great. Looking forward to more of your posts and guides. Curious to know how much you did yourself vs hired professionally? As a fellow Personal Finance Blogger, I know first hand how hard it is to let go and leave it to the people whose bread and butter is design. The first three designs were purely me and my computer just hacking around haha. This last one I hired a pro named Zach Swinehart (there is a link to him at the bottom of the site). His process was pretty cool – most developers just get some guidelines from you then go to work and hand you a finished product several weeks later. Zach and I actually went through the entire design together and had several design sessions where he asked me what I thought about the changes as he made them. I tried to stay out of his way as much as possible, which is why the site turned out so great. I’ve learned that if you’re going to hire someone to do something, you need to let them do as much as possible haha! The new design looks awesome, great work! I’m loving the little dollar signs that pop up when you hover over the menu, nice touch. It’s really cool to see the changes you’ve made since the original version – in 2 years, too.